Raasay is my new favourite island. I seem to say this after each time I visit and stay on another Scottish island. But Scotland just keeps on giving. Each island has its own charm and each time I stay I find a beauty and a charm that is unique to the place. I am writing this article as part of a Scottish Islands photography series. I travel very frequently to many of the Scottish Islands and will be bringing you stories, information and inspiration from each of the islands so stay tuned! I travelled over to Raasay after a last minute request to go and photograph the interiors for the designer at the gorgeous new Raasay Distillery. I could hardly say no. Being the beginning of February, I was excited as I love the weather that the winter brings with it. I headed straight off the ferry to the Raasay House to see if they had rooms. They did luckily enough, although I wouldn’t recommend turning up without booking in the summer! An unexpected extra on this trip was finding this little gem of a place to stay as well as enjoying the island itself. I will definitely be back to stay at Rassay House in the future. I knew the skies were going to be clear that night as it had been a gorgeous, calm, sunny day. So I had thought earlier about the possibility of heading down to the shore when it grew dark. 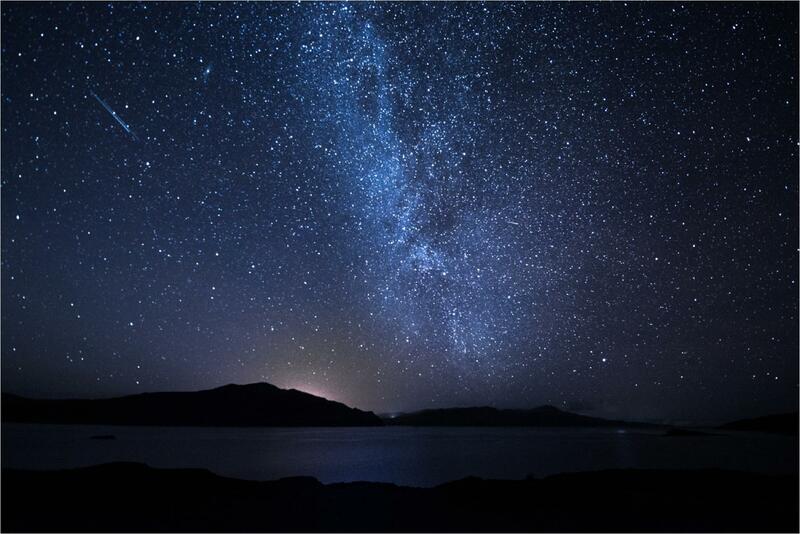 I had visions of clear starry sky shots over the Cuillin Hills with water in the foreground. What I had forgotten about was exactly how much traffic there is on Skye, as well houses and hotels. The shot was impossible with so much light pollution. But I wasn’t giving up on such a beautiful night. Not knowing Raasay I just decide to take pot luck and drive up the road I had seen on my way in. Turns out it was the only road anyway. I travelled north and sensed openness on the left hand side of me so pulled into a layby and set up my kit. The Milky Way was out, the stars were clear and not only that, there wasn’t a soul to be seen or any lights in the distance. I can’t begin to tell you what an amazing feeling it always is to be standing alone in the darkness with the vast skies above you. It’s a feeling quite like no other and I only hope that my photographs do it justice. The following morning began with a wonderful breakfast. The dining room looks over the water to the Cuillin Hills and you can sit and watch the ferry gently travelling back and forth across the waters. I decide to head over to find Calums road after breakfast. There is a wonderful story behind this road. Calum Macloed lived all the way out at on the north end of Raasay and one day decided to take the matter of there being no road to his home into his own hands. He spent 10 years single handedly building the road which stretches for almost 2 miles. I wanted to see this road but what I hadn’t figured on was it being such a high road and given that it had snowed earlier that day, my van was just refusing to make it there. So I pulled in briefly to decided what to do and realised I had pulled in next to a sign saying ” Dun Caan” So I packed up my kit and started the walk up the hill. The choice couldn’t have been better as I finally arrived at the top to the most incredible 360 degree views. 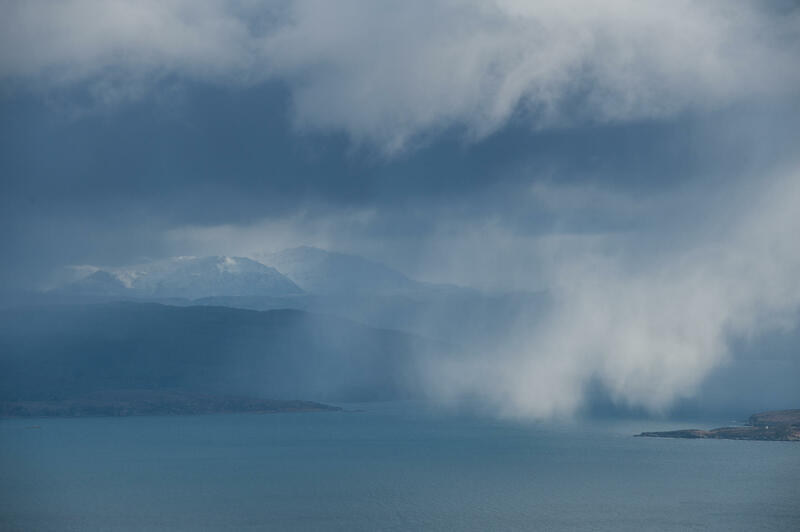 Snow storms blowing across the waters, clouds rolling over the Cuillins and the most amazing feeling of being at the very top of this island. Stay tuned for my next attempt to get to see Calum’s road! Loved your article. Raasay is indeed an beautiful island. I spent every summer holiday in Arnish staying with my aunt and uncle, Ina/Lexie and Calum MacLeod. My father Roddy, brother & I used to help out on Calum’s Road and my mother’s grandmother came from Island of Rona. My two uncles were lighthouse keepers on the island. Precious memories indeed spent with two amazing people. I feel very blessed to have spent time there. Thank you so much for your comment Eileen. It is so wonderful to hear from someone who has such close connections – what a lovely story you have. I will hopefully get to see the road in the coming months and will look forward to writing about it!